Arctic Char is praised by chefs around the world for its clean delicate texture and mild flavour. Arctic Char’s high fat content makes it well-suited for frying, baking, smoking or broiling to suit your culinary needs. Icy Waters Fresh or Frozen Arctic Charr is bred from the finest Arctic Char Ova in the world and is sought after by high class chefs internationally. Arctic Char’s popularity has resulted in it gracing not just the plates of fabulous restaurants but the plates of family kitchens too! It is available all year round and is processed and shipped fresh within hours of harvest to maintain the freshest and highest quality possible. 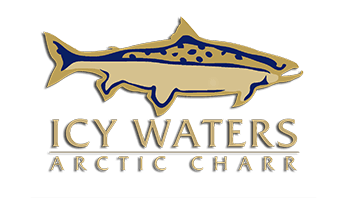 Icy Waters is the largest Arctic Char Ova supplier in the world using nearly a century of combined experience to provide the best ova on the market. Icy Waters has mastered the challenge of the Arctic Char’s complex genetic make-up and produced ova that has been bred for the favourable characteristics that our customers can rely on. Farmers can feel confident that fish grown from Yukon Gold™ Ova will mature and lead the market. Is your aquaculture company looking to increase production, grow revenue, and operate more cost effectively and efficiently? Or perhaps you are interested in starting up a new farm or investing in an aquaculture farm but lack the experience to do so. Our well educated and experienced team has over 80 years of experience in aquaculture. We pride ourselves in customer service, by getting to know our customers and their needs. Icy Waters offers a full spectrum of expertise, from egg fertilization and hatching, to grow-out processes, to the harvesting of market-ready fish, to processing the final product and marketing it to the end consumer. You name it; we have done it.